Most of our furniture originates from parts of Europe such as Italy, Spain and Germany, all of which are world renowned centers of fine furniture. For centuries, craftsman have handed down the secrets of furniture making that have made this furniture the benchmark for quality. Every piece of furniture is hand built by craftsman, many with over 2 generations of building experience in their families. The materials have been aged and allowed to dry in a natural process to eliminate cracks or other negative results of incorrect handling. In fact, all our items have to carry this high standard of quality; otherwise we would simply not be able to sell them to our very demanding clientele of design-lovers all over the world. Some of the woods used in our furniture include . . .
Ash (Fraxinus exelcior) is seen almost all over Europe and is one of the more common trees in this part of the world. It is able to rise more than 130 feet above the ground. 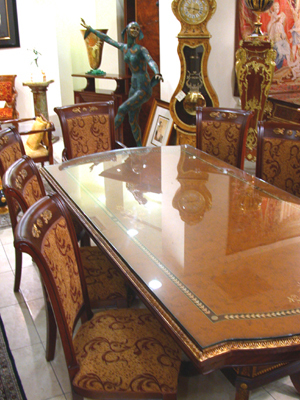 Its beautiful structure gives it several uses, notably in making our high quality furniture. Its hardness, durability and elasticity makes it very useful even in tools of practical use — for example, in broom handles. Oak (Querqus robur) has traditionally been known as a very important and valuable material. Its uses range from the construction of ancient Viking ships to today’s high-demand wooden floors. Only the grey-brown center of the oak is used. It renders a hard and heavy material used in furniture as well as in interiors.